For the second consecutive year, the Nissan TITAN has earned praise from the Rocky Mountain Automotive Press (RMAP). Last year, it was the 2017 TITAN XD Diesel that took home the title of “Rocky Mountain Truck of the Year” from the annual RMAP Awards. This year, it’s all about the Nissan TITAN King Cab model. Besting its competitors —the Ford F-250 and RAM 2500 —the 2018 TITAN King Cab was singled out by the RMAP due to its seven speed transmission, 5.6-liter Endurance® V8 gasoline engine, and four-wheel-drive performance, according to Nissan. The 2018 Nissan TITAN King Cab features the automaker’s “America’s Best Truck Warranty,” which includes five years and 100,000 miles of “bumper-to-bumper coverage.” The TITAN King Cab boasts available seating for six; the much praised 5.6-liter Endurance® V8 engine and seven-speed automatic transmission generate 390 horsepower and 394 lb-ft of torque. The 2018 Nissan TITAN King Cab is available at three trim levels — S, SV, and PRO-4X. When properly equipped the TITAN King Cab is capable of towing 9.420 pounds. 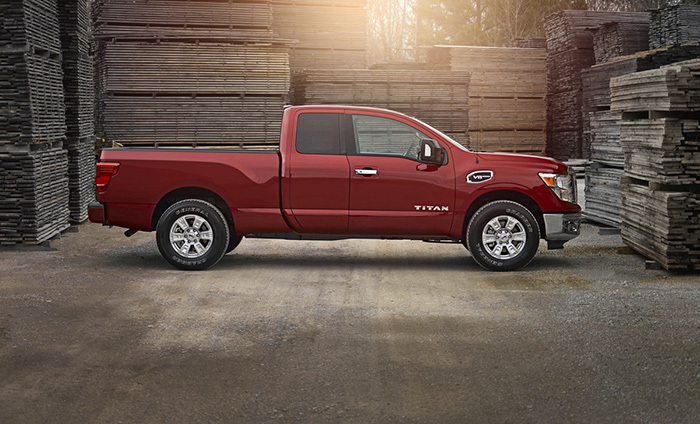 When properly equipped the TITAN half-ton is capable of towing 9,740 pounds.